LAUNCHING in the United Kingdom in 2000, it didn’t take Betfair long to become one of the most recognisable betting sites in the world today. After an incredible rise in its infantile years – which saw them win Britain’s highest business honours – Queen’s Award for Enterprise – Betfair obtained licences offshore, first in Malta and then in Tasmania in 2005. This means Betfair is the only betting exchange company that currently hold an Australian licence. The thing that separates Betfair from the other bookmakers is that the customers call the shots on the bets. Users are able to set the odds on a certain runner and other users will elect to take those odds, meaning the money is exchanged between punters rather than getting paid out by the bookmaker. It all sounds good, but does Betfair provide a service that makes it worth the switch for new customers? We have taken a comprehensive look at Betfair in our review. Betfair exchange – what exactly is it? The exchange can be an intimidating concept, but it is a simple one to grasp; the Betfair clients set the odds they want and it is up to the other users to go ahead and take them on. This means you could elect to put up odds of $5 on a horse paying $3 on the three totes, and if there is a user out there prepared to match your bet you will get a return if it is successful. If no other user chooses to take the odds you have provided, you will have your stake returned once the race has started. One of the unique aspects of the exchange is the back/lay system. Backing a team/horse works exactly as it would at any other bookmaker, meaning if the odds are advertised at $3.40 for a team to win, if you put $100 down you will get $340 back if your bet is successful. A lay bet is the opposite – you are backing a team to lose. A lay bet though is a little different, as you are going up against a fellow Betfair client, which means you are effectively taking the role of the bookmaker. If the team you go up against wins, you lose $240, while any other result would give you a win of $100 win minus a commission fee. Betfair charges commission fee on your net winnings on each market, which means if you have a net loss on a market you do not pay a commission. The standard commission is 5% for sports and 6.5% for Australian racing. A commission discount of up to 60% is applied based on how active you have recently been on the exchange. Utilising yellow and black, Betfair stands out from the pack due to the fact no other bookmakers use yellow as a predominant colour. At the top users are given the three options – racing, sport at the hub (which is an information service provided by Betfair including form, articles, statistics and how-to guides). Clicking on any of these options will bring up the chosen section, taking you to a full list of events of that day, but hovering over the drop down menu will allow you to select the specific race meet or sport you are after. On the right hand side of the page is the next to go section, which differs slightly from other bookmakers given you can scroll all the way down through meetings throughout the day and into the night rather than only seeing the next handful of races. Next to go can also be separated into a specific style of racing, whether it be thoroughbred, harness or greyhound racing. The middle of the page is dedicated to racing. Tabs at the top can take you from today’s meetings or tomorrows, show you the form or the results of the races that have taken place today. Down below every race for the day is shown in order of the meets. Thoroughbred racing is first, then harness, then greyhounds. Every race card displayed is split into the amount of races each one has, and the start time is shown. Once the race is within a five minute start time a countdown clock will begin and after the race has been run and won “RESULT” will be displayed in the time countdown’s place. Meets are set up according to the country the race is taking place, so if you want to bet at the Vaal you would go to South Africa, Royal Ascot you would go to the United Kingdom and so on. The sports you can bet on at Betfair are compare pretty well to most other bookmakers, but the racing is where they truly excel. 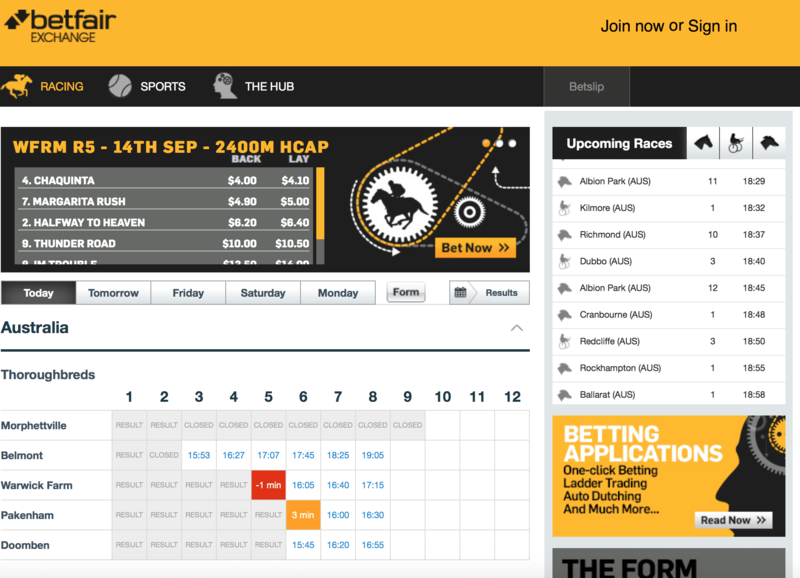 No other bookmaker in Australia provides the about of races that Betfair does, which includes a multitude of race cards from all around the globe. It is not all rosey however. One confusing aspect for punters is the wallet system Betfair utilises. Australian Betfair members are given two account “wallets”. “Main” wallet is used for investing on overseas sports and races. Wagers placed using the Australian wallet are regulated by the Australian licensed section of the company while wagers placed using the Main wallet are regulated by the Maltese Lotteries and Gaming Authority in Malta. Both wallets use Australian dollars and members can transfer money between the two with just a few clicks, meaning this can be an annoyance, but too impactful as to sully the overall experience. Betfair’s deposit and withdrawal options are not dissimilar to most other bookmakers in the marketplace. The only downfall as of 2018 is the lack of a Paypal option, but other than that all the main methods of deposit exist. Normal transaction waiting periods apply. Betfair offer a unique experience, the feeling and power of being a bookie, which something that other bookmakers cannot. The site itself is easy to navigate but weighs heavily towards the racing side of wagering rather than the sports, which is not necessarily a bad thing but it just means a little bit more digging needs to be done to find the sporting code you are after. The mass of racing options is a terrific aspect of the Betfair experience and something that almost every other bookmaker in Australia cannot compete with. Having said that, there are a few kinks that Betfair should iron out. The wallet system can be irritating given late at night in Australia punters are switching back and forth between Australian and overseas racing almost minute-to-minute, meaning punters will need to have their wits about them in regards to transferring cash from wallet to wallet. Another is the lack of a Paypal deposit option for those punters who utlitise the service. These are only small issues that pale into insignificance when stacked up against the service Betfair does provide, and we recommend any punter who takes their racing wagering seriously to open an account and get exchanging.